Can Taking Prebiotics Heal Lactose Intolerance? 75% of the world’s population suffers from lactose intolerance, and if you’re one of that 75% you know how *ahem* uncomfortable the symptoms can be. However, new research released in January of this year might have a solution for those dealing with this annoying condition: prebiotics. If you don’t know already, I’m a huge fan of prebiotics (probiotics are great, too, but I think they get all the glory!). Never heard of a prebiotic? Prebiotics feed probiotics. They are specific types of carbohydrates that selectively feed beneficial bacteria in the gut. Probiotics are the bacteria living in your gut, and prebiotics feed them to keep them alive and healthy. 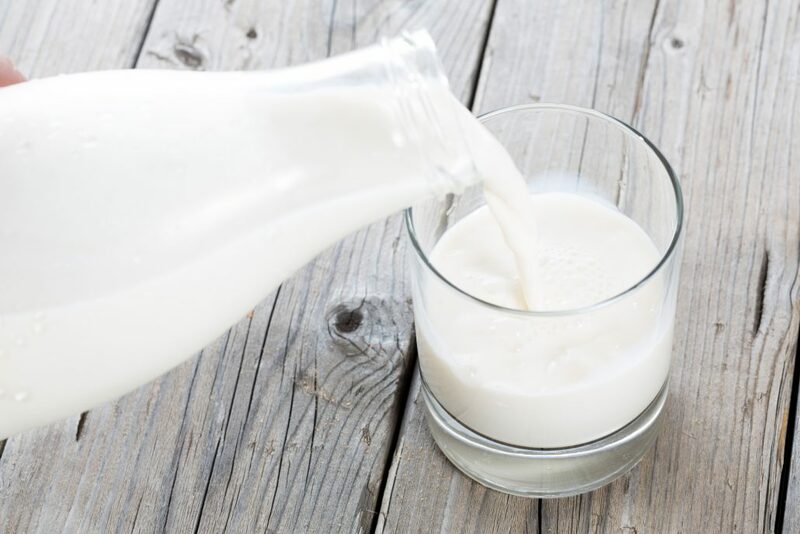 In this study, researchers gave lactose intolerant individuals increasing dosages of GOS (galacto-oligosaccharides, a specific type of prebiotic) over the course of about a month as they avoided dairy in their diet. They began participants at 1.5g of GOS and worked their way up to 15g. Each dose was given once per day. After a month of being on GOS, participants stopped taking it and started including dairy products in their diet for the next 30 days. After a month of GOS supplementation, 71% of participants reported improvement in at least one symptom (pain, bloating, diarrhea, cramping, or flatulence) and after incorporating dairy back into their diet, 69% said that their symptoms were improved. GOS supplementation and dairy introduction had a pretty significant impact on the microbiome of these participants. Researchers noted that 90% of those treated with GOS had what’s called a “bifidogenic” response, meaning that counts of Bifidobacterium were increased. Now, not everyone will respond to GOS. “Nonresponders” simply don’t see a bifidogenic response, so their counts of Bifidobacterium don’t rise in response to GOS supplementation. Interestingly, the folks who were nonresponders in this study did not see improvement in their lactose intolerance symptoms, while all participants that did have a bifidogenic response to GOS supplementation saw improvements in their symptoms. This was a pretty small study with just 30 participants, but the fact that the 3 participants who didn’t have a bifidogenic response also did not see any improvement in their symptoms is pretty telling — it likely means that at least part of the mechanism by which GOS supplementation works to improve lactose intolerance is by increasing counts of Bifidobacteria in the microbiome. Some of these types of bacteria are lactose-fermenting, so they can help you digest the lactose coming in through your diet. Should You Try GOS Supplementation to Help with Lactose Intolerance? This is, of course, just one small study, so we need to take it with a grain of salt. However, given that prebiotics have so many other benefits, I think adding GOS to your supplement regimen is a great idea in general, but especially if you’re looking to improve your lactose tolerance. As for dosing, this study went up to 15g, which is pretty high. Other studies have shown that 5g has a bifidogenic effect, while minimizing other negative symptoms. My recommendation is to start with a small amount (in this study, they started at 1.5g) and work your way up to 5g. If you would like to go beyond that, keep an eye out for some negative symptoms that can go along with higher doses of prebiotics, like bloating. Whatever dose you decide on with your healthcare practitioner, I would give yourself a solid 30 days on the GOS supplement before attempting to add dairy products back in. This study used a 95% pure GOS supplement, which, as far as I know doesn’t exist in commercial form. Jarrow used to offer a GOS syrup, but unfortunately it looks like it’s been discontinued. I’ve been using Galactomune with my clients which is a mix of GOS and beta-glucan. While I wish there was a straight GOS supplement on the market, I haven’t been able to find one (if you have, let me know in the comments!). That said, I’ve had great success with Galactomune, so I absolutely recommend it. What do you think? Will you add GOS to your supplement regimen to help improve your lactose tolerance? WANT TO IMPROVE YOUR DIGESTION? Join my newsletter to download my 5S Protocol to Optimize Digestion at Mealtime. In it, I’ll teach you how to stimulate the production of digestive enzymes and stomach acid, calm your system so it’s in “rest and digest” mode, and slow down to allow the proper breakdown and absorption of your nutrients. Making sure you are optimizing your digestion is a great first step in improving your gut health! https://kelseykinney.com/wp-content/uploads/2017/05/Depositphotos_33635123_l-2015.jpg 1000 1500 Kelsey Kinney MS, RD http://kelseykinney.com/wp-content/uploads/2016/10/website-.png Kelsey Kinney MS, RD2017-05-16 23:21:122017-10-20 18:50:34Can Taking Prebiotics Heal Lactose Intolerance? PODCAST: Should You Avoid Food Additives? PODCAST: Is Late Night Eating Unhealthy?